Everyday I come home to fliers strapped to my fence, stuffed in my gate or taped to my mailbox, for offers to repair my sewer, seal my basement or deliver a pizza. I know I am not alone. As I walk through the neighborhood I see piles of these fliers in doorways, gangways and parkways. These fliers are wasteful because most of the paper ends up in the garbage. These fliers are costly because the city must clean our streets and alleys to get rid of them. These fliers are ugly, one of our primary sources of litter. And often they are illegal. The East Village Association needs your help to solve this problem and clean up our neighborhood. At the same time, we can all help show how much of problem it really has become. In 2007 the City of Chicago passed an ordinance prohibiting hanging items on doorknobs or gates, stuffing papers in or under doors and gates, dropping off on property premises, attaching materials to unoccupied vehicles, and posting materials on public property (such as an ad on a lamppost). 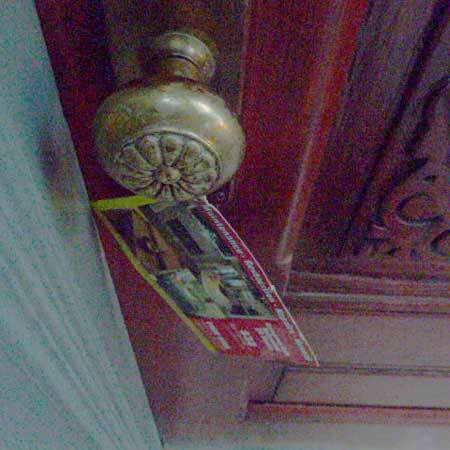 For handbills to be legally distributed, they need to have a business license number visible on the material, and placed "in an alternative receiving bin as provided by the property owner." This law does not apply to hand-to-hand distributed items. The penalty for not complying with the ordinance will be a fine no more than $1,000, and no less than $200 (Article III, sections 10-8-270, 271, 310 and 325 of the Chicago Municipal Code). EVA is sponsoring a contest to see which East Village resident can collect the most handbills and fliers. The winner gets a Dominick's $25 gift card. Bring your handbills to our Oct. 3 meeting at 7 p.m. at the Happy Village Tavern, 1059 N. Wolcott. We will tally and recycle your collected handbills and advertisements. We will send our tally to Ald. Proco Joe Moreno and Ald. Scott Waguespack and ask for their help in enforcing the ordinance. But you can do more. If a business that you like sends out these fliers, call them up and ask them to stop. If you continue to be bothered by excessive handbills, don't call 911  it is not a police emergency. Label the materials with the date and address where they were left. Other wards should contact their alderman or ward superintendents for instructions.